I never mess with Thanksgiving, but this year decided to do many tiny courses served in unusual vessels. 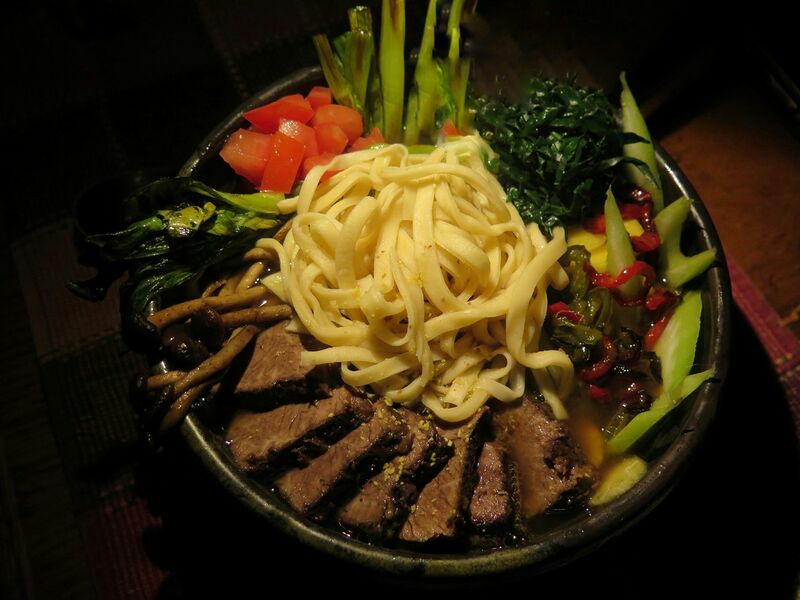 They're mostly riffs on traditional dishes so I don't think anything tasted odd. And now I don't remember the order! Thankfully great friends were there cooking with me to fill in many of the courses as well. Here are just a few of them. 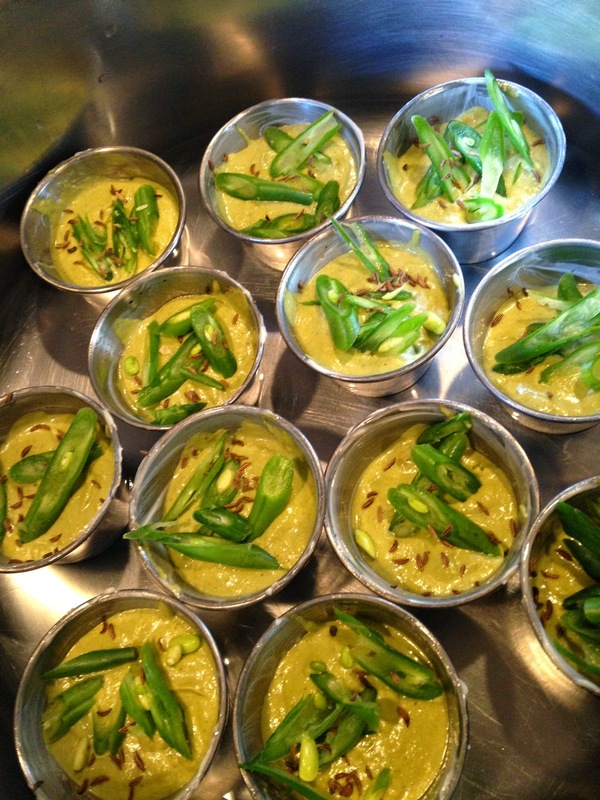 First is a green bean souffle in shot-sized timbales. Sprinkled with sumac. 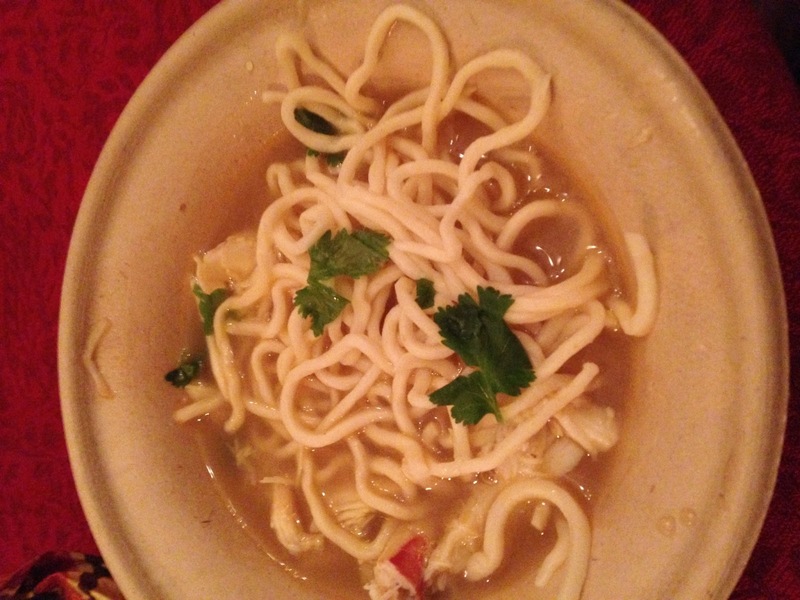 Then came a crab soup with really long fresh wheat noodles. I couldn't pass up a chance to do a noodle soup! A little sour with lime. Chewy slurpable noodles made with the Atlas roller. 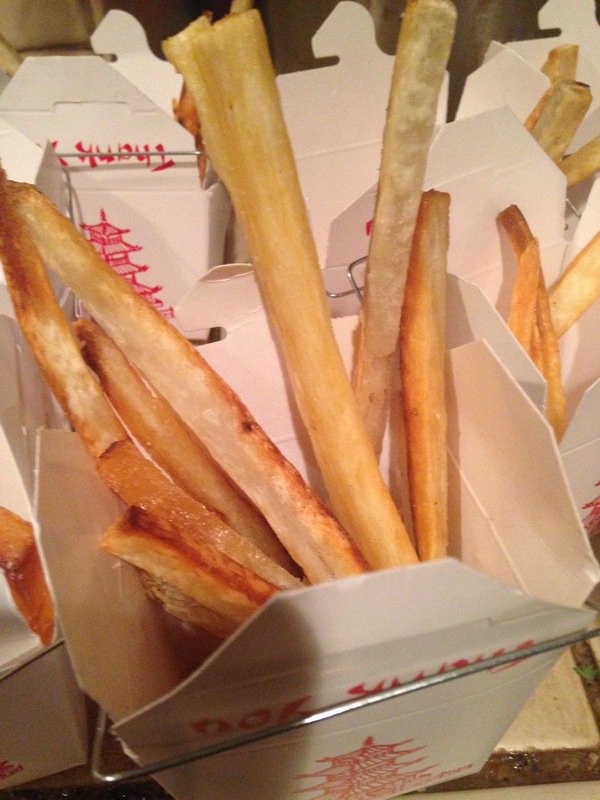 These are yucca and malanga fries served in tiny Chinese food take out boxes I found at a restaurant supply shop. I have a ton of these left to do something with. Any ideas? I think somewhere around here there was a tiny gumbo soup with a single okra in it. There was also a lovely sour lemon granita palate cleanser. 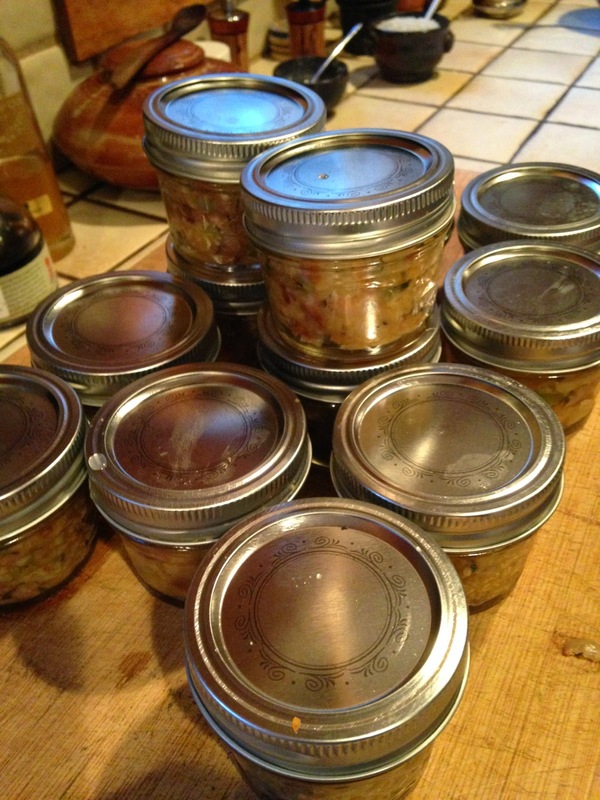 This is stuffing with celery, onion, sage, bacon in tiny jelly jars. They were reheated in the oven, and actually exploded when open. The first few dealt some serious blisters. Let cook for a few minutes and aim away is the lesson learned. There was also a raw carrot puree soup served in a red cello cup shot about here as well. Actually several raw veggie dishes. Here a single one of my kabocha squash raviolo in a tiny Asian bowl with spoon. It's seasoned with sesame and white soy sauce. Plus a little cilantro. After I had taken a bite of it, of course. I think I may prefer this version to the usual lemon butter sauce and capers. The squash has to cook down slowly in a pot for hours until a thick paste, then put into rolled sheets of dough. 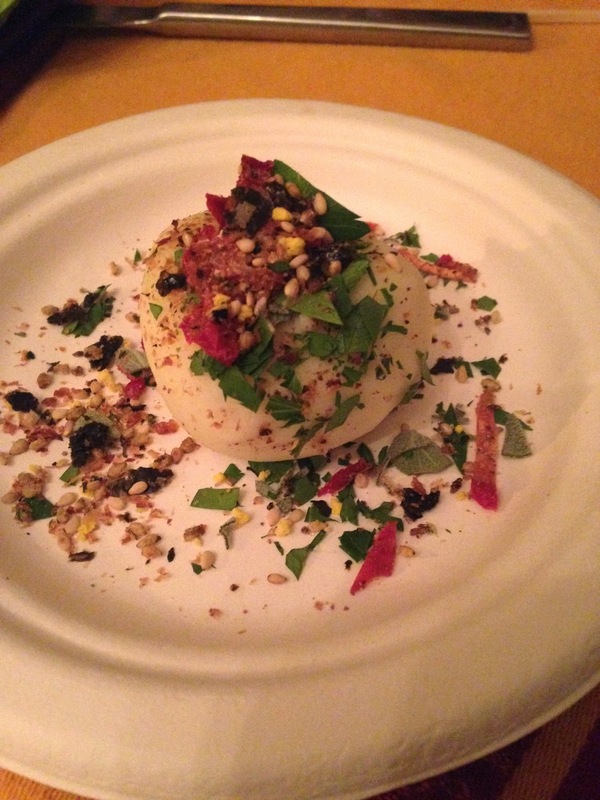 A mashed potato ball seasoned with homemade dehydrated tomato pickle chip shards, furikake and parsley. I guess my mind is fixated on Asia lately. Not pictured was the turkey, also on tiny plates and sauced with a dark stock cooked overnight and a gorgeously thick and sweet mole. Together they were really exquisite. Cranberry sauce too, naturally. 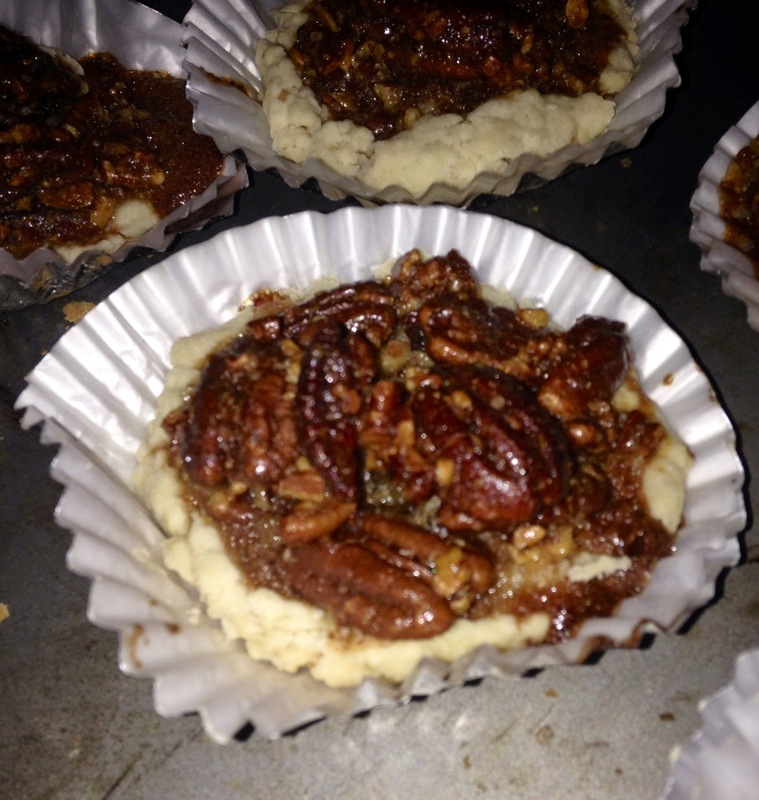 And cupcake sized pecan pie. There were actually many tiny desserts all served at once, so maybe it was only 12 courses with 17 dishes. Which ever, it was all lovely and great fun. Over three hours at the table I think. Everyone brought little courses as well. Now I just need to recover from the whole thing! I've been really into noodle soup lately if you haven't noticed. I have to write a book about it, and so I've started systematically recording every version I cook for breakfast. Some are simple, some extraordinarily complex and time consuming. This week I decided to just change little things in the basic recipe to see if I could taste the subtle differences. It's not something I've ever done before: cooking the same basic dish every day. As you can imagine, the differences are vast, just one ingredient different makes all the world of difference. This week began with beef broth, buckwheat soba and a dollop of leftover lamb chili that was laced with pho flavors. Then on Tuesday was a quick ramen in chicken broth with coconut, tomato, lime and sriracha. I actually had a packet of instant ramen and just threw away the chemical packet. Still, very quick. Wednesday was a gorgeous mung bean, chicken broth and again tomato, lime, sriracha, cabbage, scallions. Nothing like the one the day before. 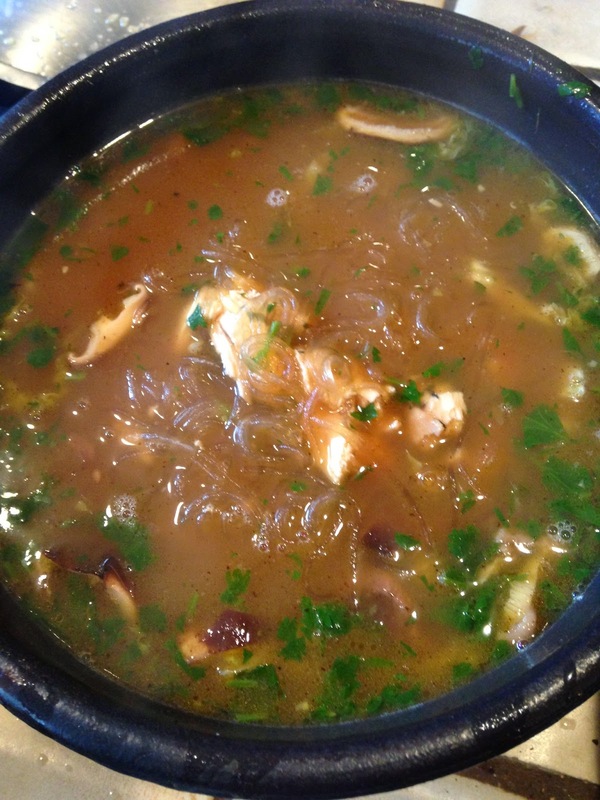 Then Thursday was fish stock, rice cellophane noodles, lemon, parsley, carrots and cabbage. It's amazing how switching lemon for lime and parsley for cilantro changes the entire dish. Saturday there was almost nothing left in the house, but wheat noodles, chicken stock, and much like the day before, but with a hit of fermented salgam suyu, changed everything. Sour and beet/red carrot-flavored. Today was the killer. An 18 hour stock cooked overnight on low in the oven. Mostly duck necks and vegetable ends. With arrowroot starch vermicelli. I never knew there was such a thing! Some shiitake mushrooms, cilantro, leftover chicken breast. It was slick with meatiness. No chili or acid, since I just wanted the stock to shine through. This bore no relationship to versions I made earlier in the week. Do you think there's the making of a whole book here? I'd say so! I don't think I've ever written a restaurant review, but this one was so out of the ordinary, I can't help myself. 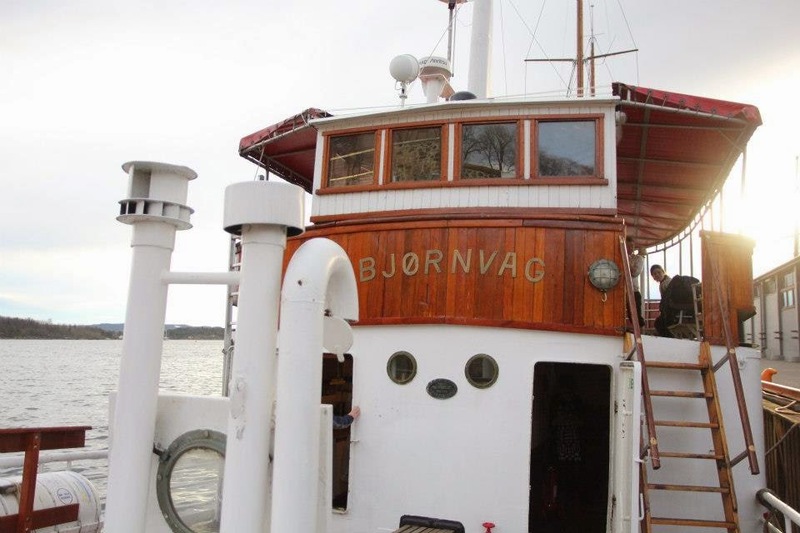 It is indeed a tiny restaurant on a boat, the M/S Bjørnvag in Trondheim, Norway. Despite this sunny picture, it was dark at about 5:00. All of 10 people were served a kind of Nordic Kaiseki meal. Two people in the kitchen, the owner/chef and a helper. The whole thing took about 4 or 5 hours. And there was a LOT of beer/wine/aquavit through it all too. There were 9 courses in all. First a pile of tørrfisk, which was perfectly fitting (shredded stockfish, dried but not salted) some seaweed flakes and crispy fried fish skin, the I swear tasted like pork rinds. Then stockfish in another guise, cooked with a kind of chili oil. Third was a bread made from beer lees, spent barley and a little packet of steamed trout that the owner caught with cubed vegs. The fourth course was the most interesting, a wedge of Greenland seal on pumpkin. I can't really describe the flavor, not fishy at all, but in texture a little grainy and chewy like grass-fed beef. I would eat it any day of the week if I could. Potatoes with trumpet chanterelles stood on their own as a course. And trust me if you have never had potatoes in Scandinavia, it's worth the trip. The sixth was a rolled leg of kid with orange sauce, roasted vegetables and everything seasoned with pine shoots. Remarkable combination of flavors. 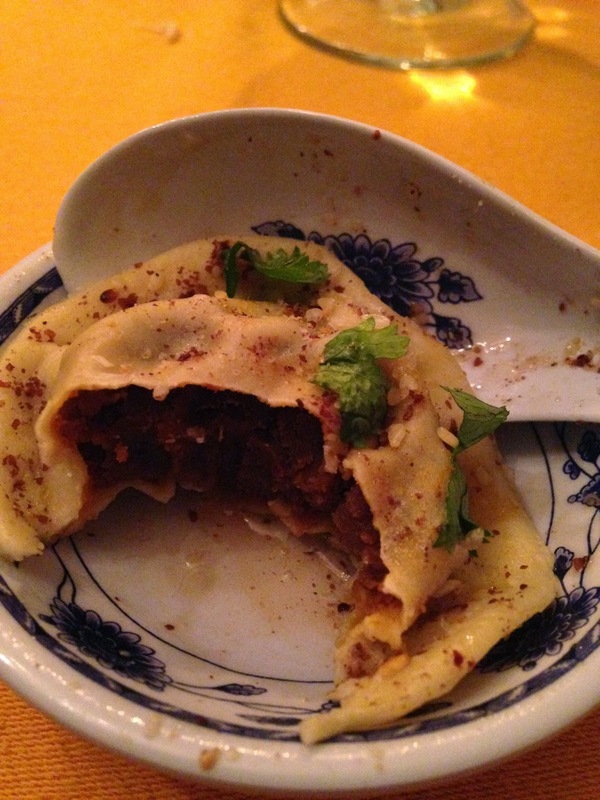 Seven was little blood pancakes with wedges of cured pig fat. Eighth was a plate of charcuterie and cheeses: bellota, lamb sausage, tetilla, goat, and a blood and kidney sausage that was very tasty. Apple tart with black currant sauce from the chef's mom's yard to end. 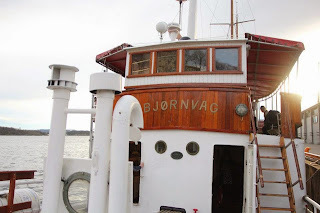 And of course aquavit. Each was a tiny course and it was spread out so well that you never tired of anything, and each course enticed the palate to continue. Every course followed the other nicely too, the cured meat and cheese definitely went better toward the end than beginning. If you ever find yourself in this part of the world in winter, this place is highly recommended. Well, This has been about a decade in the making. But it is happening in the fall 2015. And I need students!! visit the university website and get anyone you know to apply!